I'm not a big tea drinker. Blasphemous, I know. So many of my good friends are such big tea aficionados, downing 2-3 mugs of tea per day. One friend of mine even brought her own tea to a weekend wedding. But me, personally? Nah. My boyfriend has been trying to convince me to start drinking green tea, citing this article and arguing that it was one of the healthiest foods in the world. I laughed. I run a dessert blog. Healthy foods is one of the last things on my mind. So I had mixed feelings about this particular Hummingbird Bakery recipe. The last green tea recipe I made -- Green Tea Ice Cream -- turned out too tannic and had a bit of a bitter aftertaste. I had to tone it down with some Dark Chocolate Earl Grey Fudge. Tough life I lead, I know. A close look at the Hummingbird Bakery Cookbook's recipe for Green Tea Cupcakes, however, revealed that Tarek Malouf and I were on the same page. 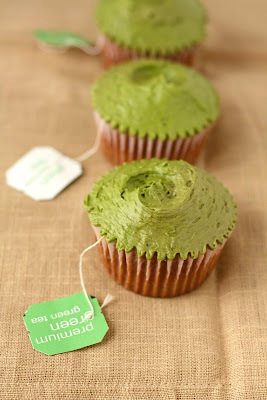 First of all, the cookbook notes that green tea flavor works wonderfully with either chocolate or vanilla. 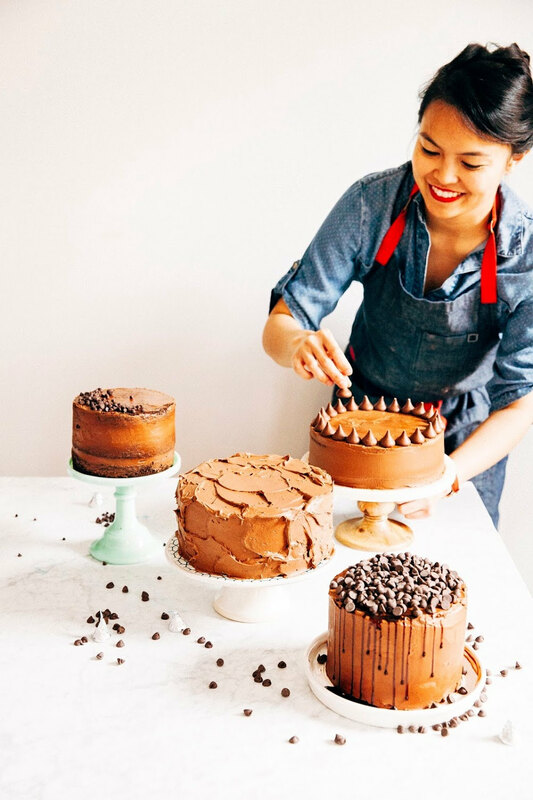 In fact, the cupcake's cake base is actually a chocolate cake base... almost the same exact recipe as the cookbook's recipe for chocolate cupcakes. The only difference was that this cake used milk that had been cold-infused with green tea. One of my readers commented on my Green Tea Ice Cream recipe that tea, when heated, can become so bitter because of the heat's reaction with the tea's tanins. A way around this bitterness is to extract the tea's flavor by cold infusion. Simply leave the tea bags in the milk overnight to infuse the milk. Which is exactly what this recipe tells you to do. 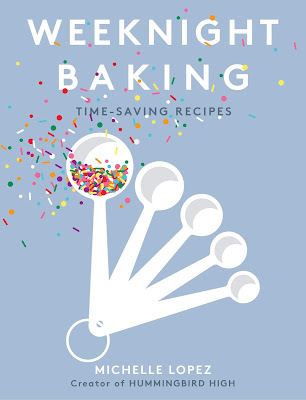 It's the same method that was used in the Hummingbird Bakery Cookbook's recipe for Lavender Cupcakes. You get have the delicate, floral, taste of tea without any of the bitterness. The chocolate cake of the cupcakes has a faint scent of green tea without any of the bitterness. I had no trouble adapting this recipe for high-altitude. Like I said before, the recipe is almost identical to the Hummingbird Bakery Cookbook's recipe for chocolate cupcakes, with the exception of the use of green tea-infused milk. The adjustments that I made for the chocolate cupcakes worked perfectly with these guys. I'd actually even made this recipe at high-altitude before. Kailin, one of my former coworkers, is a big green tea fanatic. For her birthday, she requested that I make her a batch of cupcakes. 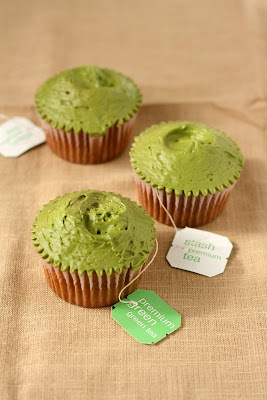 What better than Green Tea Cupcakes for a green tea fanatic? Isn't that adorable? 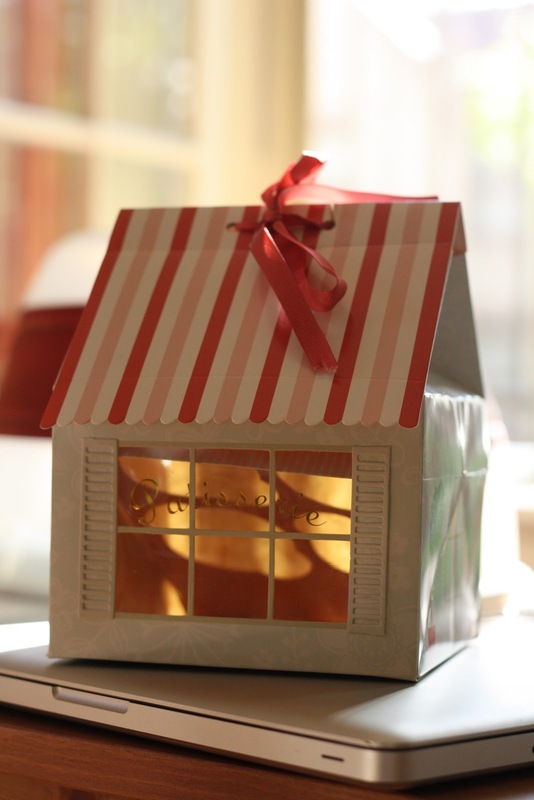 I found these on sale at Sur La Table. 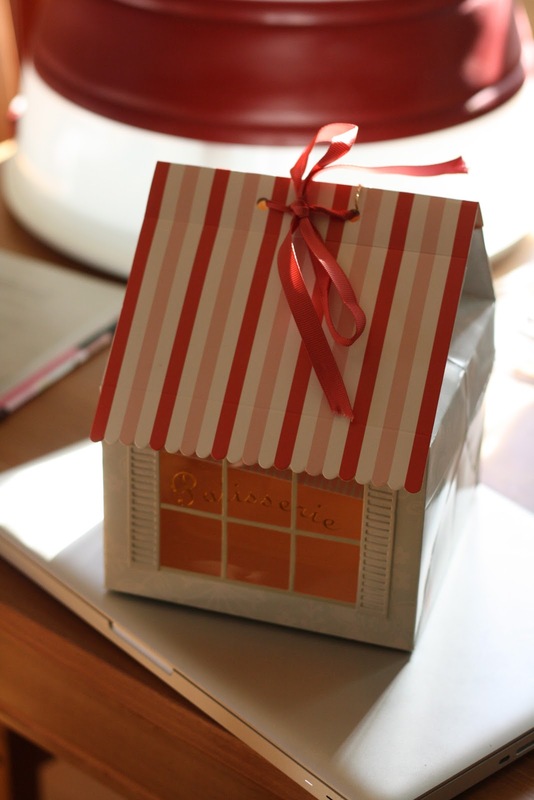 Once the cupcakes are inside (sorry, I didn't have a photo of that either. I fail), you can see them through the little plastic window. Too cute! Kailin shrieked when she saw the box. She also said that the cupcakes were delicious.